It is generally accepted that this name derives from the Gaelic Mac an t - Saoir, meaning son of the carpenter: a meaning that would account for its occurrence in so many different parts of the Highlands. But it is associated particularly with Lorne in northern Argyllshire, where the Mac Intyres of Glenoe were hereditary foresters to the Stewarts of Lorne. With the rise of the Campbells of Glenorchy from which the houses of Argyll and Breadalbane sprang, the Mac Intyres of Glenoe became tenants of Breadalbane until they emigrated to America in 1806. But a sept of Glenoe settled at Camus na h-Eiridh, probably during the 15th century, and the late Alastair Mac Intyre, the Scottish BBC broadcaster, was recognised as 16th Chieftain of Camus na h-Eiridh, oldest of the clan's cadet branches. Another distinguished broadcaster is Ian Mc Intyre, head of the BBC's Radio 3 since 1978. Neither is there any novelty in the association between this name and eloquence. 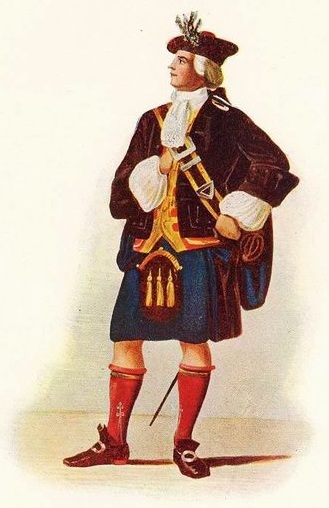 In 1496 the Mac Kintosh Chief took a Mac Intyre bard under his protection: in the field of music, so closely associated with poetry in Gaelic society, families of Mac Intyres became hereditary pipers both to Mac Donald of Clanranald and to the Menzies chiefs. The most famous of all belongs to one who followed the profession of the hereditary foresters of Lorne. Duncan Ban Mac Intyre (1724-1812) was born in Glenorchy, and spent much of his life as forester first to the Earl of Breadalbane, then to the Duke of Argyll. Thus, when much of the rest of Britain was becoming transformed from an agricultural to an industrial society, Duncan Ban was living still in the pre-agricultural setting of man, the hunter. And his Gaelic poetry overflows with the knowledge and love of nature, of the characteristics of animals and of plants, of the intricacies and excitements of the hunt that characterised the disintegrating society. Later in life Duncan Ban went to Edinburgh, where he became a member of the city guard and wrote poetry which reveals his intellectual shortcomings in a world that was foreign to him. But he received the privilege, rare for a Gaelic bard in his time, of publication during his own lifetime, and of a prominent memorial in Edinburgh's churchyard of the Greyfriars. Meanwhile the great sweep of Ben Dorain is not more beautiful than his song in praise of his favourite mountain, nor will his last farewell to the hills ever be forgotten. Gabhaidh sin an Rathad Mor.